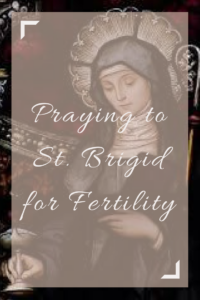 There are many Catholic Saints that you can pray to for fertility, and St. Brigid (St. Bridget of Ireland) is not the most common. She is, however, a saint of great comfort to me and I make sure to celebrate her at her feast day on February 1st. 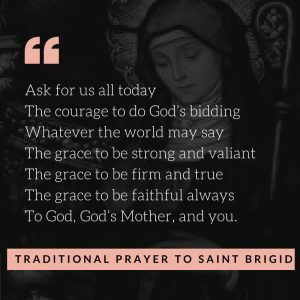 This post includes a brief overview of St. Brigid, ideas for celebrating St. Brigid’s Feast Day, traditional prayers to St. Brigid, and my own original prayer to St. Brigid to help conceive a healthy baby. St. Brigid is the patron saint of the house, women, homemakers, fire, and babies, among other things. She is known as a staunch advocate for women, wives, and mothers. St. Brigid was an early Irish Catholic Nun who became an abbess and founded multiple convents. The most famous was in Kildare, Ireland, and is said to be built on an old sacred site for the pagan Celtic Goddess Brigid. 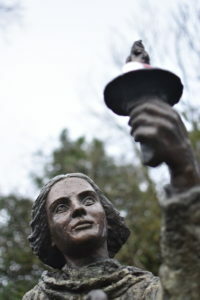 Today, Kildare is still a holy site for Brigid, with St. Brigid’s Cathedral, a gorgeous St. Brigid’s well, and the Solas Bhride Center, a Christian Spirituality Center focused on the that you can visit. While some scholars maintain she was an actual person who was born to a druid family and became a holy virgin nun and abbess, others believe the saint was a Christianization of the Celtic Mother Goddess Brigid. Her Saint day- February 1st, is actually related to the Celtic Holiday of Imbolc, a celebration of spring. For more information on celebrating a related holiday on February 2nd, read my earlier post on Imbolc & Fertility. Enjoy! However St. Brigid originated in Catholicism, I believe she is a good saint to have on your side while on your baby journey. See below for a traditional prayer to St. Bridget and one I wrote myself to pray a successful conception and pregnancy. A picture of the statue of St. Brigid at her beautiful holy well in Kildare. I was lucky enough to visit Kildare this past November! Here are some ideas for working with St. Brigid! Pray with her! See the prayers below for ideas on praying to St. Brigid. You can also free-form pray as well! Read more about her! Amazon has a number of books on St. Brigid that you could read if you were interested! 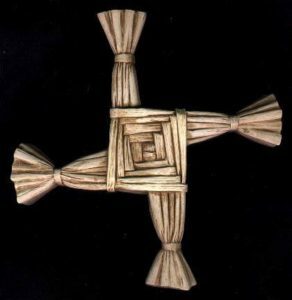 Make a St. Brigid cross, or buy one. We bought one and have it up year-round in our kitchen! Wear her medal. I love wearing Saint medals as a reminder that they are with me and to pray with them throughout the day. Visit Kildare. Or just Ireland. Kildare is her holiest site in Ireland, but there are holy wells dedicated to her across the country! St. Brigid, champion of women and of babies, I ask for your blessing. You are a healer who strengthens what is weak. You bring harmony where there is discord. Heal my body that I might conceive and birth a healthy child into this world. Strengthen my soul that I may remain steadfast in my belief in my own fertility. Bring harmony to me that my body, soul, and spirit may align to prepare for pregnancy. Prepare my heart to welcome new life with love. Hear my pleas, Brigid, and intercede for me to our Lord, Jesus Christ. Through Jesus Christ I pray. We have a Brigid’s cross hanging in our kitchen year-round! 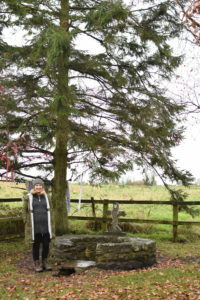 Me visiting St. Brigid’s Holy Well in Kildare! To God, God’s Mother, and you.